This post has been a long time coming. Not only have I been up to lots of transmedia business, but as it turns out, I have also been up to lots of Doctor-y business. 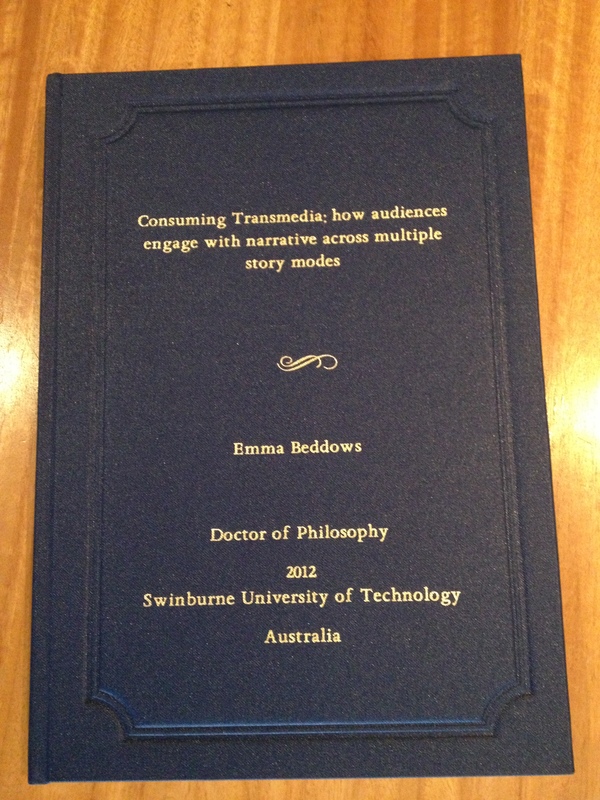 You see, I have finally turned three and a half years of blood, sweat and tears into a coherent thesis about consuming transmedia. I submitted last year and to my delight, received minimal requests for changes from my examiners (in fact, one examiner asked for minor changes whilst the other asked for none at all). Once all appropriate administrative hoops had been jumped (and how! 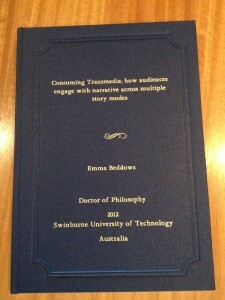 I should have a PhD in show-ponying by now) I was awarded the glorious title of Doctor. I am profoundly proud and relieved to have reached this amazing milestone. To my horror, this also means that my soul, laid-bare between buckram covers, is publicly available (in the Swinburne library, that is). To all of you who have asked to read it (see: my amazing and supportive friends, family and colleagues; you know who you are), I plan to start editing The Beast as I affectionately call it, for publication as a book some time in the next six months. See. It must be true. I wrote it online. In the meantime, here’s what the finished product looks like for all academic intents and purposes. Have you ever seen a more beautiful baby? Have you?? It’s a wonderous thing. For someone who deals so often with the abstract I took delight in feeling the weight of the culmination of ten years of study in my arms. It reminds me that sometimes I think too much but compels me at once to think more. Also, it makes a great coffee book table and brings new meaning to the phrase “to throw the book at them”. Come to think of it, it would make a great weapon, and I don’t mean that as a preface to a philosophy of the power of ideas. So what does this mean for me, aside from the fact that I can update all my business cards? Put simply, it means I can start. I can start acting, doing, working and creating in ways that I previously couldn’t. Don’t get me wrong, the last four years of my life have been spent riding out a terrifying and beautiful storm. Passivity didn’t factor into it; however, the last four years was a journey and like all good journeys it lead to something new. A new chapter in my life. If you’re ready, then so am I! Luckily I’m already a part of a vibrant transmedia community made up of practitioners, creatives, academics, intellectuals and, yes, fabulists. I’m currently working as a transmedia strategist, social media strategist and engagement strategist on a number of projects. I also teach, lecture and publish in the field of transmedia storytelling. If you need my services, if I can help you, or if you just want to talk shop with someone as passionate about transmedia storytelling as you are, please consult my contact details.